The Book of Taste is a blog & online store curated by Darrin banks. Based in Los Angeles, he offers design services & his posts explore art, entertainment, food, fitness, and fashion. Peru has been at the top of my “must-go” travel list for years! Aside from being home to the ancient Inca ruins and cuddly alpacas whose wool makes for fantastic but extremely expensive sweaters, I don’t know much about the country let alone its cuisine. Having lost one of my all-time-faves in the closing of Comme Ca, the anticipation of wondering what was going to take its place had been eating at me. When I learned it was Culinary Labs (the developers of Hinoki & the Bird) partnering with Ricardo Zarate (former chef of Picca and Paiche) for his debut Peruvian restaurant Rosaline, I knew Los Angeleno foodies were in for something superlative. As a reminder, TBOT evaluates restaurants on a scale of 1 to 10. A) Atmosphere, B) Appetizer, C) Cocktails/Beverage, D) Dessert/Coffee, E) Entrée and F) Service. We add up the scores from each category and divide by 6 to get the average. Stepping into Rosaline is like stepping into the pages of Elle Decor. From the white brick that lays in an intricate herringbone pattern on the walls and floors, to the Robert Siegel custom share plates, it seems as if the entire experience has been curated with accessible luxury in mind. To the right of the entrance is a lounge area where the front glass windows retract to the sides allowing the summer air and light to spill in. Flares of fire from the grill spray up behind plated glass where chefs are busy preparing food in the partially exposed kitchen. Patrons can sit in front of the kitchen and keep their eye on things, or to the left, where the gorgeous bar is fully stocked with unusual premium liquors. I don’t know what’s more impressive, the adventurous cocktail menu or the sculptural stainless and blackened-steel cases and shelves displaying the booze? Giant leaves stick out the lips of large recycled-glass jugs in various sizes at the end of the bar where the wait staff prepares trays to take to tables. The daylight continues to saturate the main dining area thanks to the large A-framed ceiling made entirely of glass. Much like Roy Choi’s Commissary at the Line LA Hotel in Koreatown, oversized baskets of foliage hang from the rafters amongst simplistic glass pendants dangling from long chords. Once the daylight fades away, the Edison light bulbs secured in those fixtures take over—casting a warm glow over the entire room. The custom barstools, chairs and tables are made from thick sturdy walnut the color of coffee. In the very back of the restaurant is an equally bright private dinning area with one large table enclosed by glass doors. A dramatic departure from the architectural layout of its predecessor Comme Ca, it wasn't until I went to the restroom to wash my hands and saw the classic French bistro tiles that I registered the countless times I’d used those same facilities in the past. By opening up the walls of the space Culinary Labs managed to create 4 specific lounge/dining areas that seamlessly flow into each other. Energetically, I felt like I was walking into the house party of an urbane interior designer in Venice, CA—as if all the patrons in this commercial restaurant were friends giving each other air-kisses and catching up on old times—that’s how inviting and aesthetically appealing Rosaline is. I could definitely see myself grabbing drinks and a light snack a couple times a month—an ideal summer hangout. I gave the atmosphere a TBOT 9.4. Named after Zarate’s mother, Rosaline’s food is meant to be shared la familia style. Thank God that doesn’t apply to cocktails because they were way too delicious to share. My good friend and I had the “Jab To The Jaw,” made with cactus pear & strawberry brandy and the “Quita Calzon,” made with el silencio mezcal. 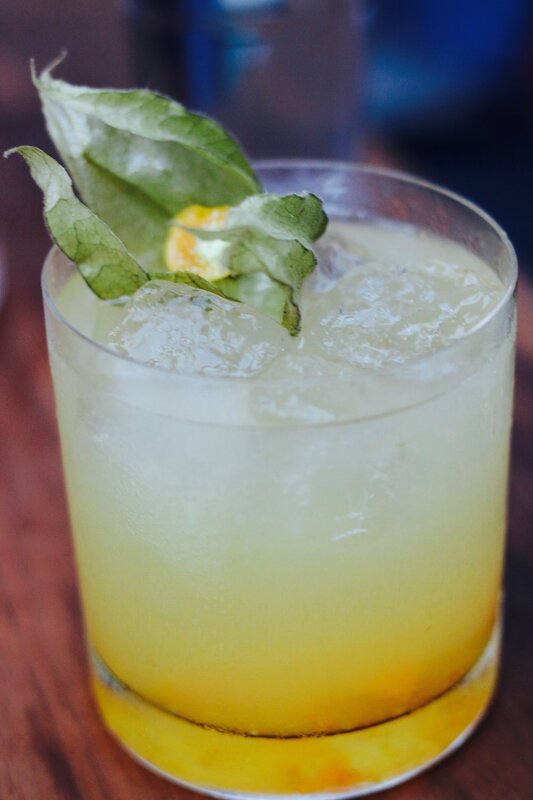 The Chinese five-spice continued to bring subtle heat in the “Jab,” while gooseberry and coconut water balanced out the smokiness of the mezcal in the “Quita.” Both were refreshing and citrusy. Later we enjoyed glasses of the “Ferreira Planalto Reserva.” Bright and smooth, with the right amount of acidity to cut the delicious fats in the paella (we’ll get there shortly) it was an excellent pairing. I gave the cocktails a TBOT 9.0. For our abrebocas (small plates) we skipped the ceviche and went for the “Camaron a la Plancha”—blue prawns. The prawns were seasoned with Zarate’s take on the Japanese paste yuzu kosho. You could taste the hint of chili and the tartness of yuzu fruit. Faint but definitely present—squeezing the charred lime over them brought out the flavor even more. We devoured the “Chicharron de Paiche.” The lightly fried fish was elevated by Zarate’s decision to crisp the quinoa coating. It gave the bites a nice texture. The yuzu aioli that came as a dipping sauce is the type of aioli you wish you had at home—you just want to put it on everything. Our last small plate was the “Aceitunas”: marinated spicy Peruvian olives, eggplant puree, and cancha corn with turmeric flat bread. I did feel the eggplant puree got a little lost amongst the powerful heat of the olives and the generous (perhaps too generous) helping of cancha corn, but not enough to throw the dish completely off balance. I absolutely loved the turmeric bread sticks—the shape and color of banana peels that arrived in their own Rosaline brown paper baggie. It was little presentational touches like that throughout the night that augmented our meal and the meals of those around us. For example, one of our neighbors ordered the “Causita Crocante” which arrived in a vintage wooden saltbox. Overall, I gave the abrebocas a TBOT 9.1. We decided to share something from the soil (Allpa) to go along with our paella. We chose the “Solterito,” a lima bean salad with avocado, blistered cabernet tomatoes, pickled onions, feta, Botija olives and choclo corn. Hefty, firm lima beans, creamy avocado and salty feta combined beautifully with the juiciness of the blistered tomatoes that bursts with every bite. An excellent dish for sure, but I flew to the top of Machu Picchu when I tasted the “Chaufa Paella.” Imagine: Peruvian fried rice paella-style with bacon, sausage, prawns and a runny egg that’s mixed into the dish by the server once it arrives! Not since visiting Segovia, Spain, have I had paella this good. The signature, scorched bits of rice called socarrat one finds at the bottom of the cast iron skillet were mixed in with the fluffy rice to create the ideal texture. Free of heavy oil and grease, the paella was surprisingly light given all the meat-lovers-pizza ingredients present in the dish. Now my favorite paella ever, this was hands-down the best dish we ate that evening. I gave the large plates a TBOT 9.7. We did not have coffee but we did share Peru’s version of a macaroon. The “Alfajores Macarons,” were more like a sandwich cookie than a traditional French macaroon made from almonds and egg whites. Dark chocolate beet, maracuya passion fruit, manjar de banana, and spiced xocopili chocolate are the current flavors of the house-made treats. I particularly liked the passion fruit. I gave dessert a TBOT 8.9. Although everyone from the hostess to the busser was incredibly friendly and our server was knowledgeable about the menu, I do have to say the only negative I consistently experienced was in the service. Grant it, the restaurant has only been open for a week and a half, so I think they are understandably still working out some kinks—computer glitches perhaps…a breakdown in communication between bartender, server and kitchen staff…I’m not sure, but as nice as everyone was, being able to enjoy our drinks along with our meal in a timely fashion would have been ideal. That being said, practice makes perfect, and I am confident that those kinks will get worked out in a relatively short amount of time—the restaurant is too exceptional to not be top-notch across the board. It certainly wouldn’t deter me from eating there again, but I gave the service a TBOT 8.0. Earning an overall solid TBOT 9.0, I’m dying to go back for more. I obviously intend to try other dishes when I return, but one non-negotiable will always be that paella—even if it ends up in a to-go box. I could eat that for breakfast, lunch and dinner! The Book of Taste is a blog & online store curated by Darrin Banks. Based in Los Angeles, he offers design services & his posts explore art, entertainment, travel, food, fitness and fashion. Sign up with your email address to receive news and updates from The Book of Taste. © 2017 The Book of Taste LLC. All rights reserved. The Book of Taste and TBOT are trademarks of The Book of Taste LLC.